Established in the year 2013 at Ahmedabad (Gujarat, India), we Heet Healthcare Pvt. Ltd. are noteworthy OEM Manufacturer, Exporter, Trader, Importer and Wholesaler of Pharmaceutical products such as Bortenat for Injection, Natdac 60 Daclatasvir 60 mg Tablets, Jardiance Empagliflozin Tablets, SoviHep 400 mg Sofosbuvir, Ledifos Ledipasvir 90 mg & Sofosbuvir 400 mg, MyDekla 60 mg Daclatasvir Dihydrochloride Tablets, Daclahep 60 mg Daclatasvir Tablets, Careprost Eye Drops etc. The offered products are processed using high-grade chemical compounds and active agents with the help of contemporary machines in compliance with set medical industry norms. Our offered products are widely used for the treatment of various disorders and surgical purpose in hospitals. Moreover, these products are stringently checked for their quality on series of quality parameters before being supplied to our clients assuring their safe usages and long shelf life. We offer these products to our clients in safe packaging options to prevent them from environmental factors and provide safer delivery at user’s end. Our offered products are widely appreciated by our clients for their enormous features such as safe consumption, balanced composition, quick relief, highly effective, long shelf life, zero side effects, safe packaging, etc. We are committed to participating in the practice of providing good health to everyone, and we do this by delivering innovative surgical products and reliable medicines at a competitive cost. We are instrumental to expand our options for developing superior quality products through optimizing the technological advancements. In order to harmonize our production process with diverse medical approaches across the globe, we are staffed by diligent R&D experts. Our guiding force Mr. Devendra Mathuria is well versed in the challenging industry and motivates every team member to deliver viable products that benefit the society. Our infrastructure plays a vital role in developing a firm repute for our company. Featuring adequate expansion capabilities, our infrastructure is fully equipped with modern day advancements and high-end machinery for research and manufacturing. Further, our back office infrastructure is majorly parted into highly functional factory division, testing laboratories, packaging, stocking and distributing department. 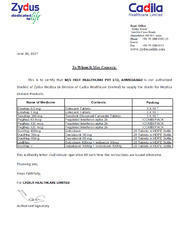 We are authorized stockist of Zydus Heptiza. Our team comprises of people with diverse outlooks, values and ideas that are shared and respected with a common interest to add value to the company. We have developed corporate working relationships with our stakeholders and esteemed customers due to the diligent efforts of our R&D specialists, manufacturing experts, inventory managers, quality assurance associates along with skillful workforce and distribution professionals. The driving force behind our steady growth is our pledge for assured safety and effectiveness. We believe the quality of life depends on our developed pharmaceutical products, which is why we have partnered with industry-leading vendors to source most reliable inventory of raw material. Moreover, keeping the true nature of healthcare in mind, we have preferred quality over quantity as the bottom line for the day to day business operations. At Heet Healthcare, our mission is to provide humanity as a whole with a wide choice of reliable, cost-effective, safe and quality medicines for the improvement of health, thus helping all human being to live healthier lives. Our vision is to strengthen our position as a quality pharma supplier and strives for leadership by continuous product innovation and technology up gradation. A Unit of our Product is sold in whole India. Products prescribed by more than 12,000 doctors.